When I decided to begin saving for my first multi-month trip, I avoided thinking about the fact that I would eventually have to quit my job. Hoard money, first; walk away from years of hard work and a career that I enjoy, second. As my departure date drew near, I grew anxious about my decision. In the end, however, I knew that my life was about to enter awesome-mode, and I just had to survive walking away. I quit my job at MKTG INC 1 ½ years ago (shout out to all the bad-asses over there—they’re seriously good at what they do), and I have been brought back twice since to work on a contract/project basis while in-between trips. It has worked out better than I had ever hoped. And so, here is some advice on how to leave your job and hit the road without burning any bridges. Plant the seed – Talk about your desire to travel with your coworkers. Initially I was afraid that talking about my dream of leaving San Francisco and seeing the world would make it seem that I wasn’t committed to the company. However, when the time came to actually quit, my coworkers knew how important travel was to me and supported me as I made the leap. Ask for a sabbatical – Don’t be deterred if your company doesn’t have a sabbatical policy. In fact, that’s more reason to ask as you could be the first to get the wheels spinning. Just remember, you literally have nothing to lose as you’ve already decided to walk away from your job. If they say no, then so be it—you’re leaving anyway. But if they say yes, then you can travel knowing that you will have income down the road to make up for whatever you spend. While I’m a big advocate of keeping your travel plans (including duration) loose, there is something to be said for eliminating the anxiety surrounding the question, “What am I going to do when I get home?” Leave a comment below if you’d like to see the sabbatical request that I submitted before leaving for my first trip (it was denied, by the way, but everything has worked out as it should). 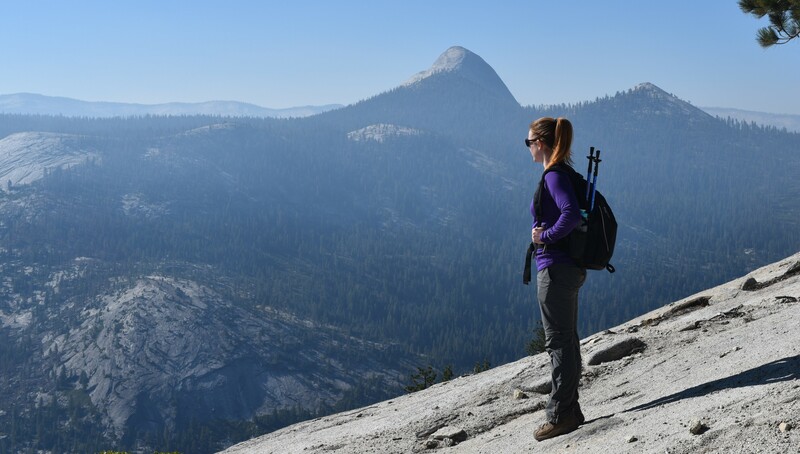 Voice how travel will make you a better employee down the road – My friend Kiera is a high school history teacher (currently on a one-year sabbatical) and is volunteering and wandering through the places that she talks about in her classes. What better way to convey excitement about a place or topic than to have experienced it first hand? “Oh that? That’s just a picture of me giving Ho Chi Minh a high-five at the mausoleum in Hanoi. And speaking of French colonialism…” Is your company pursuing a bigger portion of the Hispanic marketplace? Picking up Spanish in Central America could benefit them once they secure their first big client. Working at a non-profit whose donations have plateaued over the past year? Volunteer with a similar organization abroad and pick the brain of their Development Manager. Come back with a list of ways that you can use free social networking sites and word-of-mouth marketing in order to boost donations without increasing spending. If you think creatively, you can relate the experiences of any trip to becoming better at your job. For me, travel has provided a tool much more powerful than those that can be listed on a resume—perspective. Multiple coworkers have commented that I’m better at my job after taking time off. Work is no longer my whole life—it is something that I enjoy doing in order to make money and see more of the world. Feel like you’re burnt out and need a break? Tell your boss that. Honesty won’t hurt you here. Give adequate notice – Whether requesting a sabbatical or quitting outright, you need to give your company at least a month’s notice before you go. Long-term travel obviously takes time to plan, and if you provide only 2-weeks of notice, they may resent you for putting them in a position where they can’t hire a replacement quickly enough. Offer to train your successor, create a presentation on capabilities that only you seem to possess—be as generally helpful as possible and you will depart on good terms. Just go… I had second and third thoughts about leaving my job, right up until the day that I cleaned out my desk, handed in my corporate Amex, and cracked open my first cerveza. My coworkers wanted me to stay, amazing projects were coming down the line, I was finally promoted to the position that I wanted—it was everything that I had worked for. There were plenty of reasons to stay, but in the end, even more to go. And I’ve never looked back. … but stay in touch. Once you’re on the road, send updates to your friends in the trenches, your boss who encouraged you to go but implored you to stay, and even that oblivious guy who always called you “Abby Bibbs” (I am Ali Biggs, for the record). Just because you’re out there exploring doesn’t mean that you shouldn’t actively maintain your network. You created meaningful connections with these people and now you get to share all of your amazing stories. Odds are, once they get over being mildly (or overtly) jealous of your experience, they’ll want to hear how they can do it, too. 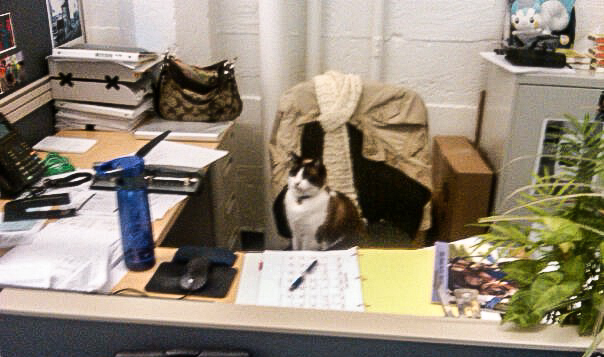 My cat, Dixie, at my desk a few years back. She wasn’t nearly as supportive (of my dream to travel the world) as my coworkers were.